Basecamp 2 and 3 have a lot of things in common, but they're pretty different too! 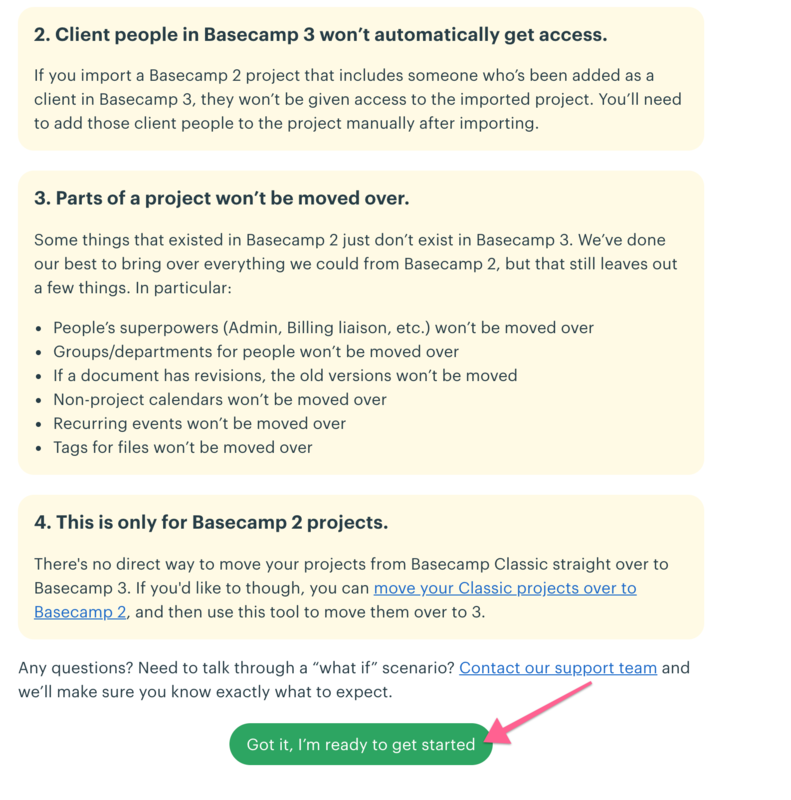 Before you start moving your Basecamp 2 projects over to Basecamp 3, you should know what will and what won't be moved over. The project will now show for importing inside your Basecamp 3 account. And here's more on working with clients in Basecamp 3. You might find it helpful to do a bit of both. Pick up the things you're currently working on and bring them over to Basecamp 3 — everything else can stay in Basecamp 2. 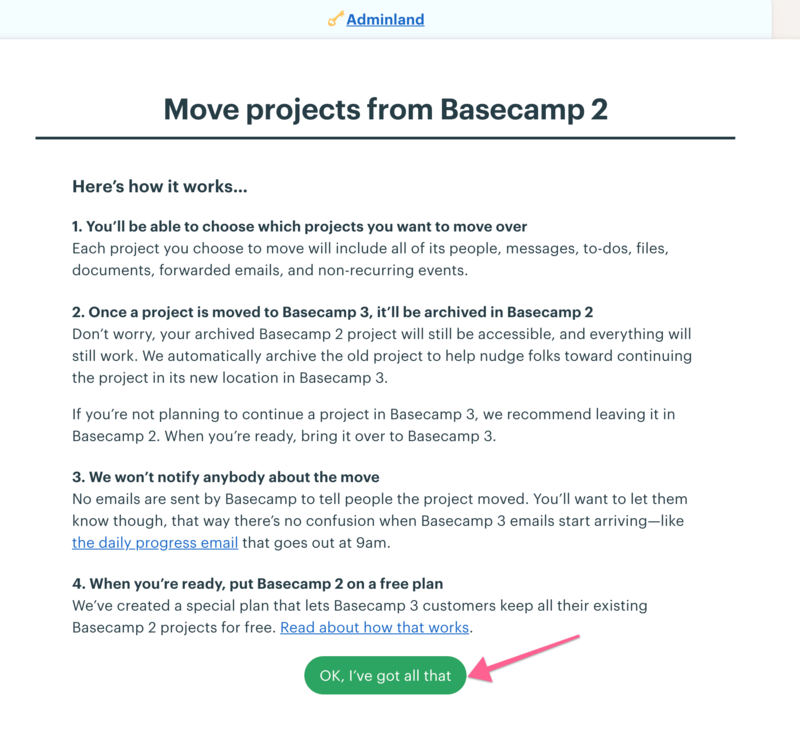 If you keep some projects in both places, be aware that all of your Basecamp 2 users and clients will also be added to your Basecamp 3 account when you migrate a project over. On the next page, read through the explanatory text until you see the "Ok, I've got all that" button. Click that button! You can migrate projects from any Basecamp 2 account you own. 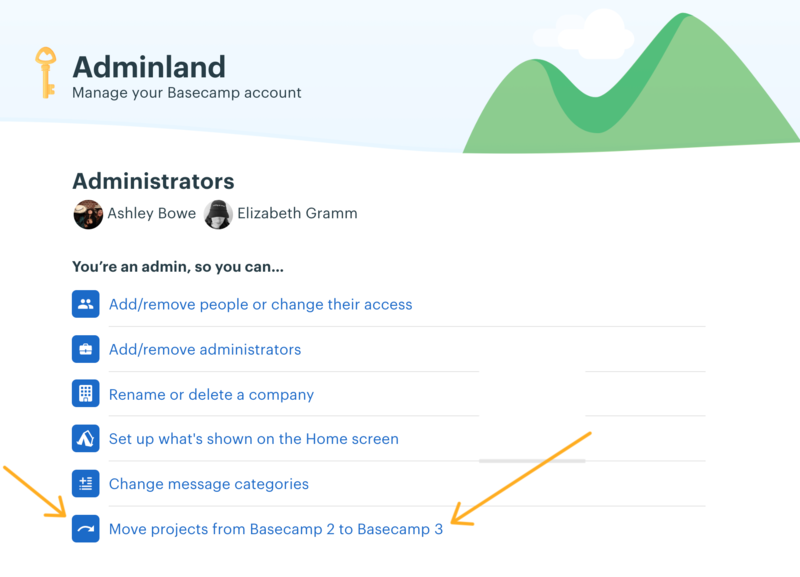 If you're on multiple Basecamp 2 accounts, you'll be asked which one you'd like to move projects from. Everyone on a project will move to Basecamp 3 if you migrate that project over. Additionally, all users and clients on the account will be moved over as regular, non-client users in Basecamp 3. This is because Basecamp 2 and Basecamp 3 handle clients in different ways. The migrated users won't have project access until you either invite them to a project or migrate their Basecamp 2 projects as well. Once everything has been moved over, your Basecamp 2 project will be archived, and you'll see your project in Basecamp 3. Yep! Everyone in your Basecamp 2 account will automatically be added to your Basecamp 3 account when you import your first project.